That’s all folks! In May, we wrapped up one of our most fun events, the 41st annual Atlanta Jazz Festival (AJF). As one of the country’s largest free jazz festivals, this event requires a bit of strategic media pitching and social media engagement to get the best results. From checking in media and setting up artist interviews to live posting on social media during the event, we had some busy weeks leading up to festival weekend. The prep work for AJF included creating and promoting a feedback survey for the festival, updating the mobile channel we created for the event, arranging television and radio interviews with the artists and facilitating conversations in a new app, SpokeHub, which enables real-time conversation around specific topics. In the weeks leading up to the festival, we scheduled more than 20 interviews for television and radio stations including WJZA Smooth Jazz 101.1 FM and Atlanta’s city news channel 26. One of our main duties during Festival weekend was live tweeting and posting on Instagram and Facebook. If you have ever covered an event live, you probably have some experience with going live on Instagram and Facebook. Due to the change in Instagram’s algorithm, the story and live video features have become the best way to ensure your content is seen by your followers. Aside from increased visibility, Instagram and Facebook Live offer the opportunity for increased engagement and relationship building. However, if you aren’t a pro, here are eight tips from some Instagram and Facebook savvy media mavens with some street-smart c21 advice! 1. Make sure to determine the point of your live broadcast before starting it. Kaley Hart with Jumper media emphasizes that Instagram live should be used to promote things that wouldn’t be as effective with a normal post. At the AJF, we used Instagram live to promote the artist interviews and performances that were taking place giving folks behind the scenes access. To ensure your posts have the maximum impact, make sure to plan what you want to say and what you want to film. “Your outline should include call-to-actions, like “Follow me on Instagram” or “Don’t forget to comment,” notes Hart. 3. Prep before live interviews. When interviewing someone on a live video, be sure you prep them beforehand with questions, and make sure they are comfortable with answering them on camera. Don’t forget that it’s Instagram and Facebook Live so the interview should be fun and informative for followers. The key to a great live interview is making it conversational, which requires both you and the interviewee to feel relaxed! 4. Test the sound and video quality. Ideally you would film your Instagram live video in a quiet place with a clean background and good lighting. According to Christina Bonnington at The Daily Dot, a good way to see how your video will turn out is by shooting a tester video. Try different views and angles and find the best spot for lighting and acoustics. If you have ever filmed from an event, however, you know this step is nearly impossible. When going live at the AJF we tried to embrace the fun, bustling atmosphere created by 150,000 attendees by finding a good angle and focusing on the loudest attraction, the performers. 5. Promote your broadcast before and after you go live. It is important to let your followers know when to tune in to your live broadcast so you can maximize the number of people who see it. Desiree O with Brit + Co notes that can save your live video so that your followers can see it for the next 24 hours. When you go to save, you have the opportunity to use features like the @mention sticker and the polling sticker, which allows you to increase engagement with your viewers. 6. When it comes to an event, don’t give it all away in the video. According to c21 intern Carter Brown, when going live on Instagram or Facebook at an event, the point is to highlight what is going on to entice the viewer. Give people a sneak peek so they want to come out and experience the event for themselves! 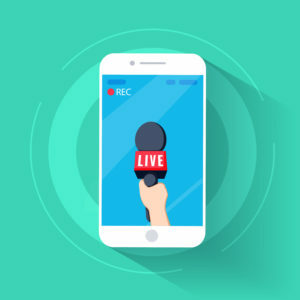 For example, if you are going live at a concert you can film short clips of the music, conduct interviews or interactive Q&A’s to drive interest. Live videos are the perfect way to engage with your audience. Both Instagram and Facebook allow you to respond to your viewers while filming live, so take advantage according to c21er Frances Chang! If you or the person filming you can respond instantly to comments or questions, the viewer goes from an observer to an active participant. 8. Live up to the hype. Make sure what you broadcast is interesting and relevant to your audience. c21 intern Amari Wilson stresses that you should not go live for just any reason because it takes away from the tool’s effectiveness! Remember to measure. Taking a look at your live video insights is helpful in gauging the effectiveness of your video so you can continually improve. How many people watched live? How long did they watch? Did you reach your audience? On Facebook you can see a variety of metrics relating to your live videos. From detailed insights on the number of views and average time watched to the people reached and post engagement. You can get a good idea of how successful your live video was and the areas where you can get better. Instagram, on the other hand, is currently far less informative when it comes to live video insights. When you end a live video, you can only see the total number of viewers. Since the two tools are owned by one company, we’re hopeful analytics will continue to improve. Stay tuned.